‘They’ arrived very slowly and blended in very smoothly. Our narrator is among the elite ‘Knowers’ – the only ones able to track down and eliminate 4D aliens (The Fordans). The Fordans completely blend in with the general population thus making the Knowers’ jobs extremely difficult. Our narrator will have to face the toughest decision possible during the latest hunt. Give me some rough numbers, how much do these performers sell their death for? In a world where the dark net has become commonplace, “performers” are able to sell their deaths via pay-per-view. We listen in on an interview with the sinister creator of this wildly popular web series. I really liked the way Sayal portrayed such a wildly evil world – this one definitely worked for me! This hilarious negotiation has to be read to be truly appreciated – suffice to say, Genies have updated their systems to include clauses written in legalese. 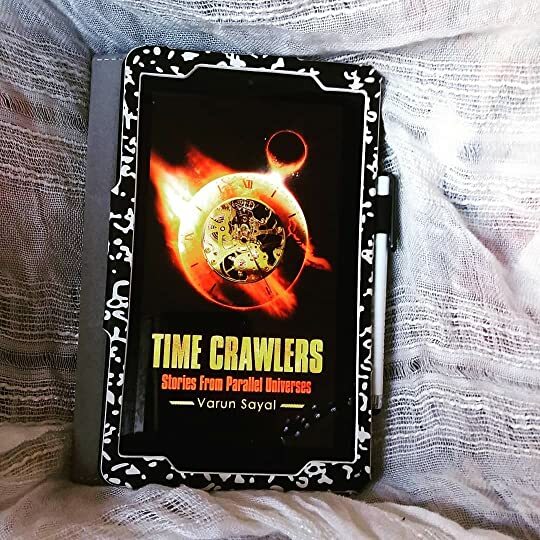 Another interview styled story, this time about “time crawlers” and how they exists in every-day society. I wish this one wasn’t pure dialogue. That being said, I did enjoy it (especially that ending – wow!). Short, sweet and entertaining. Just goes to show that sometimes it’s better not to go poking the metaphorical bear in the cave. This was also told mostly through dialogue (like the previous two) and while it kind of worked, I think it would have benefited from some background details/actions. Death is a very easy solution for the problem of your sins. This one wasn’t quite as gripping as the other ones but it still had some good moments. Sayal expertly wove Indian mythology into the future but I feel like I needed more than a rudimentary background to fully appreciate what he wrote. Hello Miranda, thanks a lot for this honest review and a beautiful book pic. I really loved the very appropriate quotes you picked from each of the stories, they are so close to the essence of each story. My next book is going to be a full novel with science fiction elements such as Time Travel, aliens combined with ancient Indian mythology. These beautiful words coming from seasoned readers such as you give me more power and motivation to keep writing. Thanks again for that. My pleasure, your encouraging words motivate me to write further and better. Cheers.